Punjab CM Scholarships 2019-20 PEEF Punjab Educational Endowment Fund has been announced today. CM PEEF Scholarship is is invited the application form from the eligible and interest candidates for both male and female but the condition is that candidate must have Pakistani nationality. Who have secured admission in the top 50 QS Ranked University by the Subject wise, And Subject area is provided below. The Board of Directors is providing opportunities to the show your talented and needy students to fulfill their dreams and aspirations and at the same time to become partner in the development and welfare of Pakistan. 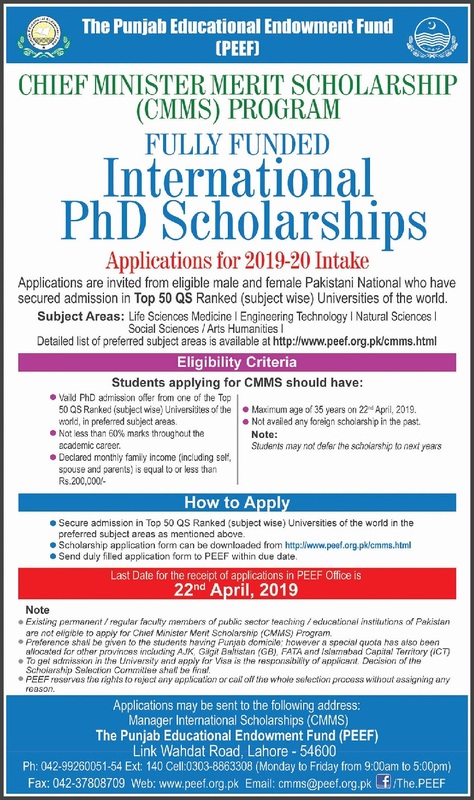 Government of the Punjab has launched Ph.D Foreign Scholarship programme under PEEF 2019. Candidates who are eligible male and female students, as per the eligibility criteria set for this scheme has been updated you must read carefully and Follow the Instructions. You will be awarded scholarships for Ph.D level Education at the top ranked universities of the world. The scholarship scheme focuses the meritorious students of Punjab while allocating a special quota for the students of other federating units of Pakistan as well. It is golden opportunity for those candidate who want to complete their education and fulfill the eligibility criteria they must apply for CMMS PhD International Scholarship 2019. Maximum age of 35 years on 22r4 April, 2019. world, in preferred subject areas. Existing permanent / regular faculty members of public sector teaching / educational institutions of Pakistan are not eligible to apply for Chief Minister Merit Scholarship (CMMS) Program. You must feedback us and rate us about your experience with us and in case of query about you can comment us we will help you.